With more people utilizing take-out dining options, pizza delivery is growing strongly in my neighborhood. Today is Friday and I expect plenty of delivery cars on the streets near my home tonight. The pizza segment has a long tradition of take-out and delivery service. Canned tomato products have experienced modest increases and flour is trending higher. Market Data from Foodservice.com (www.foodservice.com) - An Online Community for Foodservice Operators was used in creating the chart. Early January market prices from 2007 to 2008 have increased 62.5%. 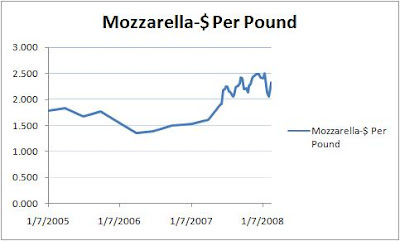 The trading range in recent months, between $2.00 and $2.50 per pound, is well above 2006 levels. Pizzas use anywhere from 6 to 12 ounces of mozzarella cheese per pie. Many operators pay 75 cents more per pie for this key ingredient. If the target food cost percentage was 25%, they'd have to raise prices $3.00 to maintain margins. With plenty of delivery and take-out options competing for market share, a $3 increase may be a tough sell. I'd recommend more profitable add-on sales to improve results. Soft drinks, garlic knots (a New York favorite), salads, chicken wings, and other non-dairy options could help the bottom line.